Last week, I posted that I’d been up at our Niobrara Valley Preserve, helping to set up timelapse cameras to document the recovery of that site from the wildfire last July. Back in February, photographer Michael Forsberg, Jeff Dale, Rich Walters, and I picked out preliminary locations for nine cameras. Jeff then built the camera systems, and we got them installed and started up last Tuesday and Wednesday. Mike and Jeff are part of Moonshell Media, the group we’re contracting with for this project. You may have seen their work before – most of the Moonshell Media staff are also working on the Platte Basin Timelapse project, which includes video from one of our Platte River wetland restoration projects, along with numerous other stories of water and the Platte River from headwaters to mouth. 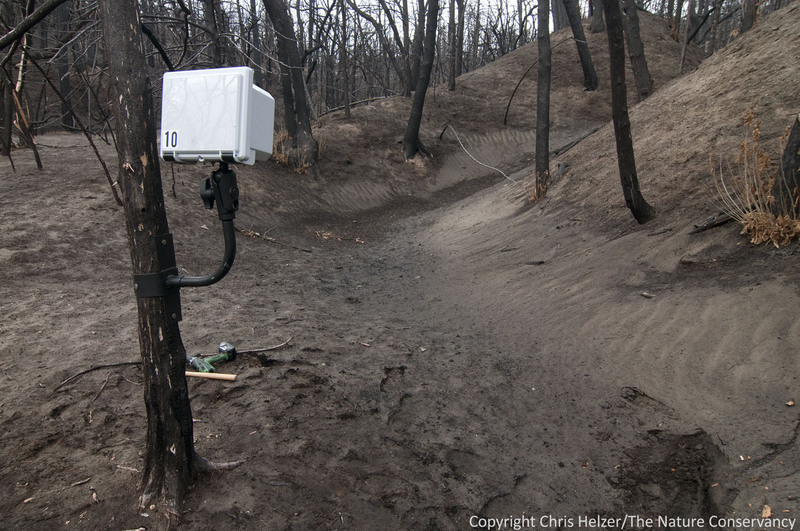 This timelapse camera will be taking a photo every daylight hour for the next several years, recording the recovery of this landscape from the Fairfield Creek wildfire in July 2012. 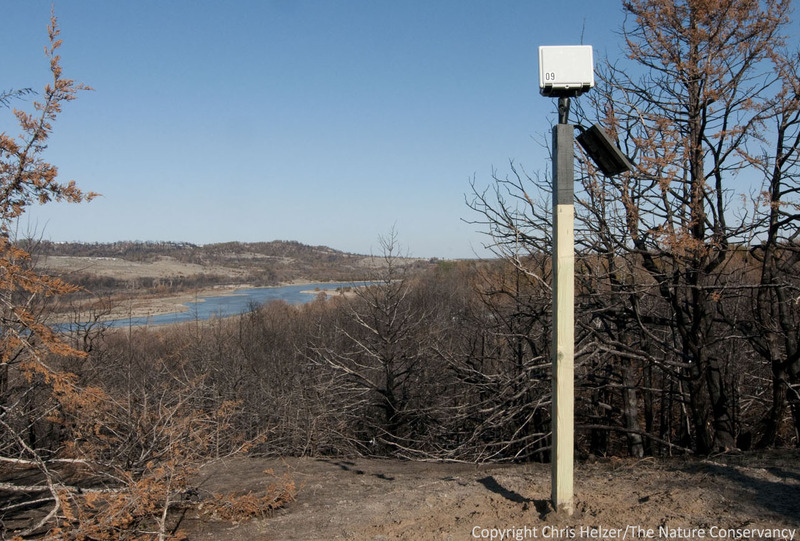 The timelapse project at the Niobrara Valley Preserve is being funded by the Nebraska Environmental Trust, as part of a larger project to study the aftermath of the wildfire and generate information to help reduce negative impacts from similar events in the future. Eacn of our nine cameras will be taking one photo every hour, during daylight hours, for at least several years. An additional camera will be a mobile unit that we’ll move from location to location to document short-term changes or events. 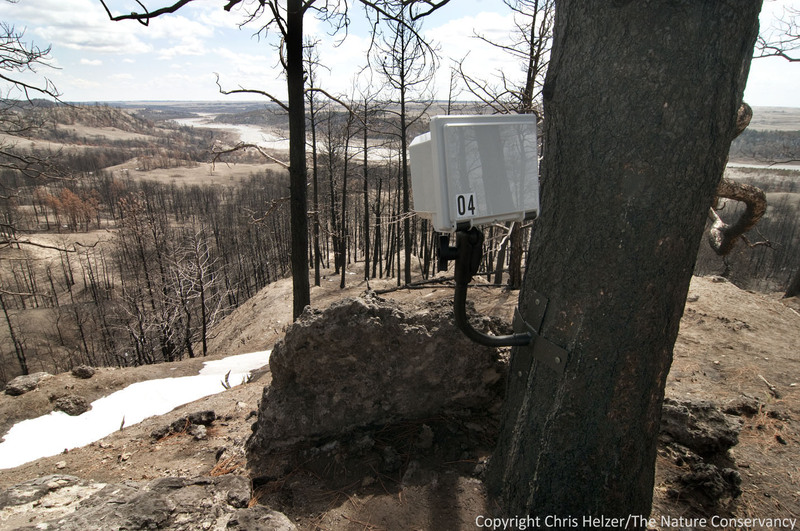 The cameras will help us tell the overall story of wildfire recovery, but will also link with and help illustrate the results of several research projects happening in the same places. Here are some photos of the installation last week, along with descriptions of what some of the cameras will be documenting. I will, of course, let you know when/where videos from the project can be viewed when its time. Jeff Dale fastens a camera mount near the top of a windmill tower. 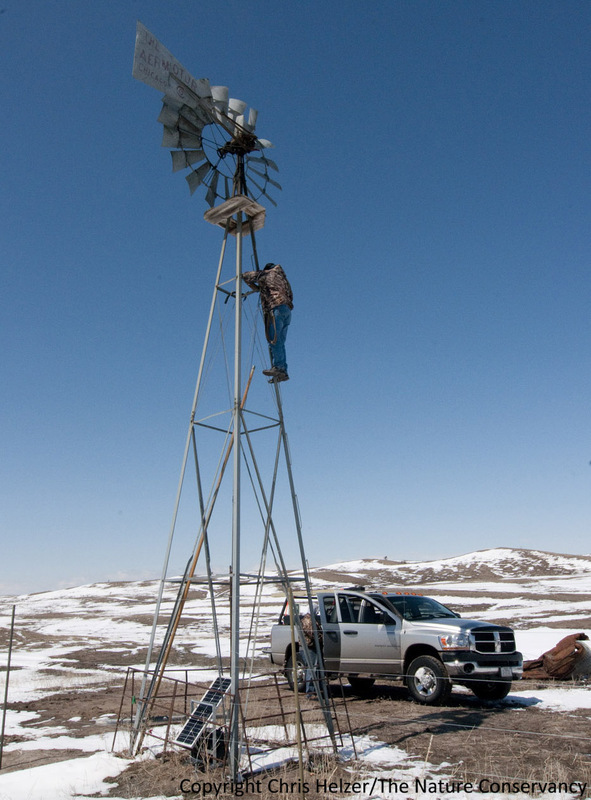 The “windmill cam” will capture a wide view of bison-grazed sandhill prairie as it greens up this spring, and then will follow it over the next several years, as dynamic patterns of bison grazing, weather, and prescribed fires shape its habitat structure and species composition. 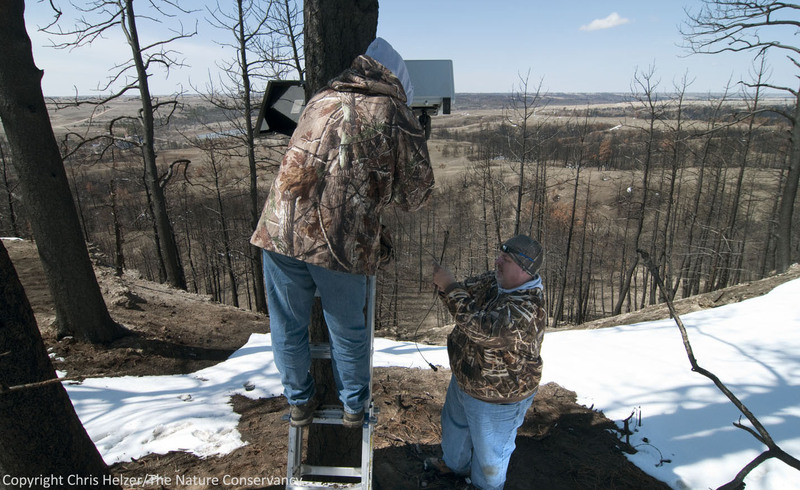 Jeff Dale and David Weber install a camera that will look straight down a steep slope on the ridge north of the river. 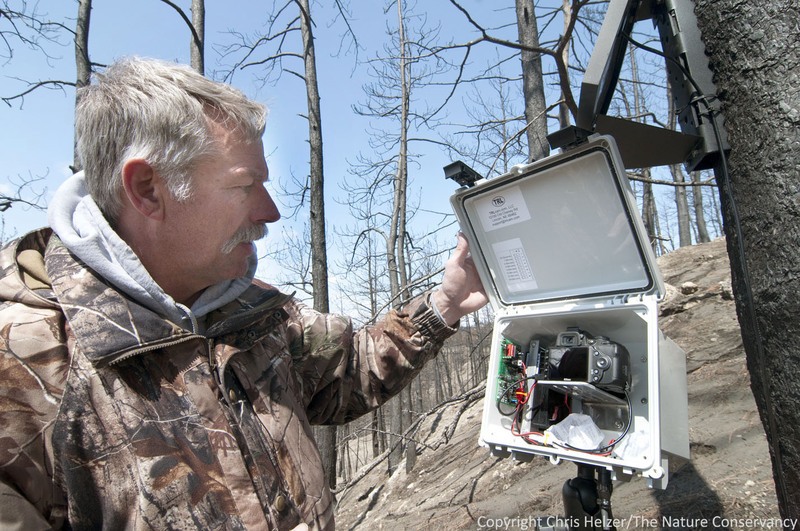 Among other things, this camera will help capture evidence of any soil erosion that occurs over time under the burned ponderosa pine woodland. This camera is set up to record any sediment that pools up at the base of the (formerly) pine-covered ridge. In addition, it will record the resprouting of several oak trees growing within the frame. 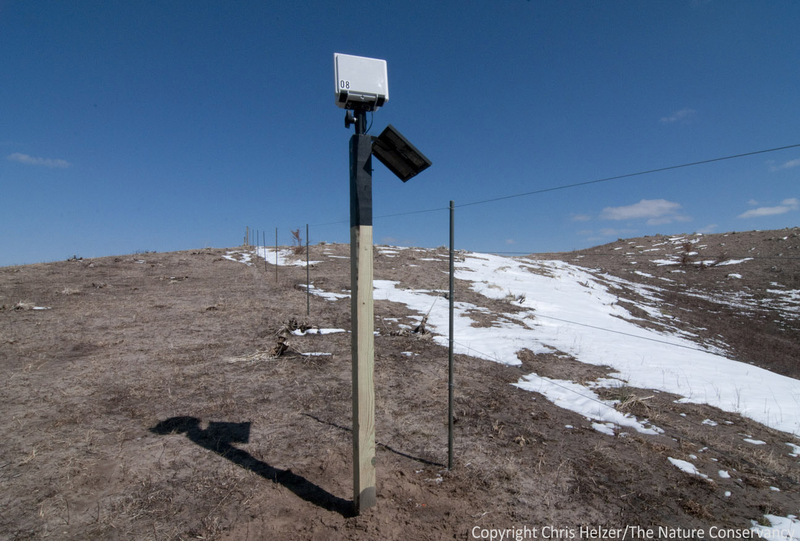 This camera was installed on a new fenceline – rebuilt in a new location after the initial fence was destroyed by fire. The new fence location expands the south end of the bison pasture into what was formerly cattle pasture. The camera will record differences in the recovery of prairie grazed year-round by bison (left) vs. prairie grazed only periodically by cattle. One of many differences we expect to see is that yucca will largely disappear in the bison pasture. Winter grazing (by either cattle OR bison) suppresses yucca, which is rarely grazed at all during the summer. 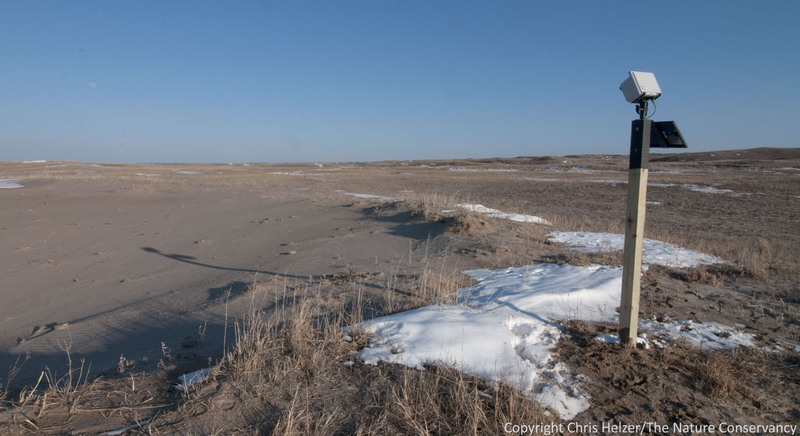 How fast will this sandhills blowout carve away recently-burned sand prairie? Our camera will help us find out. Based on previous experience with summer fires, we don’t expect to see any significant increase in wind erosion, but this camera (combined with aerial photographs, and perhaps on-the-ground measurements) will allow us to test that assumption. 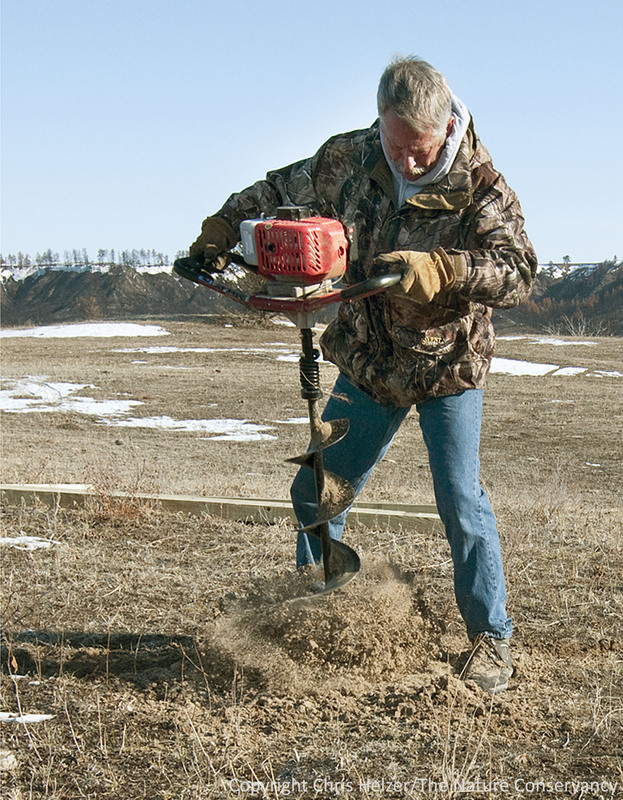 Jeff digs a post hole for the camera I’m most excited about. This camera will focus on a 8×10 foot rectangle of bison-grazed prairie, looking straight down on it from above. Over the next several years, we should be able to watch the plant community recover from the fire, but we’ll also see yearly differences in which species bloom, when they bloom, and how they respond to weather, grazing, future fires, etc. We can also record any long-term changes in the plant composition within this area. We want to see how the plant community will recover underneath dense cedar trees now that those cedars are dead. We expect lots of weeds, but hope not to see many truly invasive plants. This entry was posted in Prairie Animals, Prairie Natural History, Prairie Photography, Prairie Plants and tagged fairfield creek fire, jeff dale, michael forsberg, moonshell media, niobrara river, niobrara valley preserve, timelapse, timelapse photography, timelapse video, wildfire, wildfire recovery by Chris Helzer. Bookmark the permalink. Is Jeff will to share (post) his setup somewhere or is it proprietary? You’d have to ask him. You can contact him through the Moonshell Media link on my post. Just hearing the name Niobrara takes me back to when i first read “The Immense Journey” by Loren Eiseley back in the ’60s. Keep up the good work, ya. What an exiting project. I visited the Preserve, didn’t know it was closed, September 2012 on my way back from the Sandhills. Plants were already sprouting in the open areas. This time lapse photo project is a great idea. I’m very interested in the post fire recovery, particularlyl the woodlands. 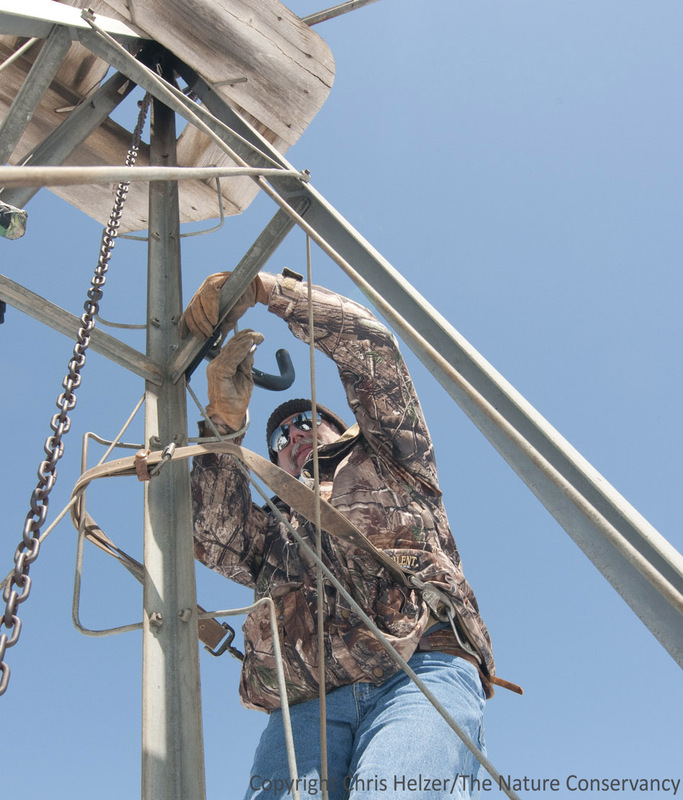 Ed – The Environmental Trust covered the cost, so no out of pocket to TNC except the time and travel to do the installation (and long-term work to get the data and keep them running). Bet the bison will enjoy their new scratching posts! ; ) What a great project that will keep you busy writing papers for a long time…………. Becky – you are correct about the scratching posts! We’re working on armoring around those posts to keep that from becoming a big issue! This is an excellent use of modern technology. For good examples of repeat photography methods — using outdated cameras — check out the work of Progulske in South Dakota, Charles Kay in Utah (much of it online), and Fred Hall and Jack Ward Thomas in eastern Oregon. When this information is combined with early land survey data, historical maps and photos, and oral history interviews, a very sound basis for restoration planning is established. What a great idea to help us gain understanding of veg community changes/recovery. Are there any similar projects that you know of where years of photography have already been accumulated? The Platte Timelapse project has been going for a couple years now. I don’t know of any others, but there are likely some out there. This will be very interesting to follow. You have my attention. Dan, let me see what I can find out and I’ll let you know.